Delicious, hot and cheesy grilled ham and swiss panini sandwhiches couldn't be made any easier. They're perfect for a holiday brunch, or a filling winter meal. 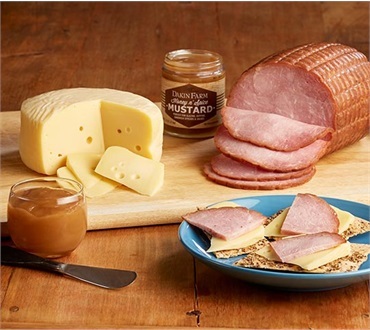 With our "combo" your gift pack arrives with our fully cooked, cob-smoked boneless ham and unique baby swiss cheese wheel, along with tangy honey mustard. So easyand tasty to use for hot or cold sandwiches, egg dishes, salads, and more with hefty, family sized quantities to feed the whole crew through the holidays.